We've answered our most frequent questions below. If you can't find an answer to your question(s), please feel free to contact us below. The essentials that you would usually pack for any holiday abroad. Don't forget sun cream, mosquito and bug spray, and a lightweight rain jacket or something to keep you dry for the mountain trek. You don't need walking boots for the trek, but we advise you bring trainers or something sturdy other than sandals and flip-flops. We advise a little rucksack for the day to have as well as your main backpack. Bear in mind that you will be carrying the backpack yourself (not for long periods of time), so pack light! You do not need to bring a tent and sleeping bag as bedding is provided in the accommodation we stay in, but you will need your own towel for the beach! And don't forget your camera! Once you have paid for a tour, we will send you a full advisory packing list! Yes. Everyone who enters Bali will need a tourist visa, which lasts for 30 days. If you plan on staying longer than the tour, you will need to investigate what visa suits you best. The tourist visa is free for most nationalities, including the UK, Europe, USA, Canada, Australia and New Zealand, and will be around $35USD for others. You collect the visa at the airport when you land and is easy enough to do. If you are unsure about any visa requirements, please feel free to contact us. The Bali Adventure holds no responsibility if you are unable to enter the country. Your passport must be six months in date of arrival to Bali! It depends on how long you plan to travel. If you're just doing The Bali Adventure, then all your accommodation is included, plus 21 meals, and most activities. You will need spending money on the other meals plus drinks, plus any extra activities you want to take part in. Food and drinks are usually low in price in Bali, but you should still budget yourself around £20-30 per day; also consider if you plan to buy yourself or our family or friends any souvenirs. £500 is a minimum amount we advise to bring, which is an average amount spent. SHOULD WE BRING CASH OR CARD? We advise bringing at least the equivalent of £100 changed to Indonesian Rupiah to start your travels. It saves you having to worry the first few days trying to find a cash machine or exchange money. We advise bringing a bank card/travel card for back up, just in case of any emergencies. ATMs are available throughout Bali and accept Visa and MasterCard. We don't advise traveller's cheques as they aren't accepted everywhere in Bali, and we do not advise carrying large amounts of cash on you at once. It's a lot safer to take cash out every few days. Most travel cards would do better rates than your bank card if you didn't want to bring your bank card with you. If you are travelling from the UK, you will need to make sure you are up to date with your general holiday vaccinations, Typhoid and Hepatitis A. You will not need to pay for these, and your local GP will be able to do them for you. If you are travelling to other countries before or after Bali, you may need some extra vaccines. We advise you to check with your GP beforehand if you are unsure. There is a low risk of Malaria in Bali. Therefore you do not need to take any medication for Malaria. Yes. Although The Bali Adventure is relatively safe, travel insurance is compulsory if you wish to take part in the tour. This is not included in the tour price and will need to be arranged before the tour begins. 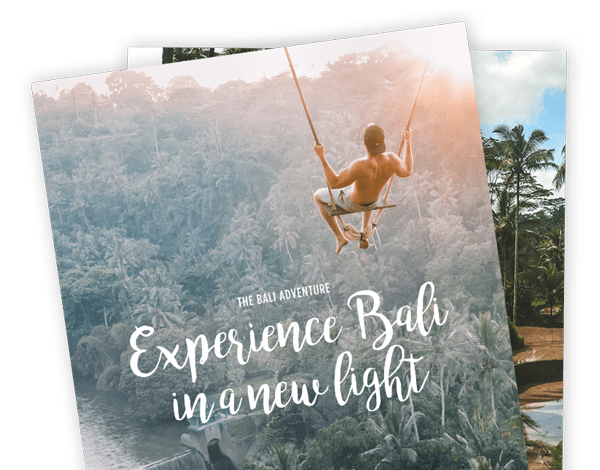 We recommend getting travel insurance which will cover medical expenses, loss of luggage & valuables, missed flights and all the activities you shall be taking part in, on The Bali Adventure. The Bali Adventure will require this information before the trip begins. WHAT'S THE BEST TIME OF THE YEAR TO VISIT BALI? Weather-wise, the temperature is usually around 30 degrees all year round. The dry season is typically April to September, and wet season October to March (although it only rains for an hour or so), so it does tend to get busier in the dry season. The mountain areas of Bali, which you do visit on The Bali Adventure, are typically colder than the rest, and temperatures can drop as low as 15 degrees, even in dry season, we’d advise packing a lightweight rain jacket, whichever time of the year you come, just in case! SHOULD WE BOOK MY FLIGHT BEFORE WE BOOK THE TOUR? We advise you not to book any flights until you have received an email confirming the tour has at least 10 people (minimum number of people per tour). The earlier you book your flight, the cheaper it will be, so we advise not to leave it until the last minute! WHAT DATE/TIME SHOULD WE BOOK MY RETURN FLIGHT? Once you have paid your deposit shortly after you will receive a booklet via email, with all the information you'll need about the tour. We will have a farewell meal and drinks on day 17, so we advise booking flights after midday, so you're not too tired of your return home! WHAT TIME SHOULD WE ARRIVE ON DAY ONE? Arrive any time before 10 pm preferably! It can take up to an hour for transfers from the airport to the hotel, so we advise your flight lands no later than 8 pm. You cannot check into the hotel until 2 pm, but you can relax by the pool, check out the local area and recover from the jet lag during the day. Yes! Most people that take part in The Bali Adventure travel on their own. We'll set up a private Facebook group before you travel to Bali to meet the other people in your group you'll be travelling with, plus your tour leaders. You'll soon make friends when you arrive, so you have nothing to worry about!